Liverpool won 2-0 against FC Porto on Tuesday night. 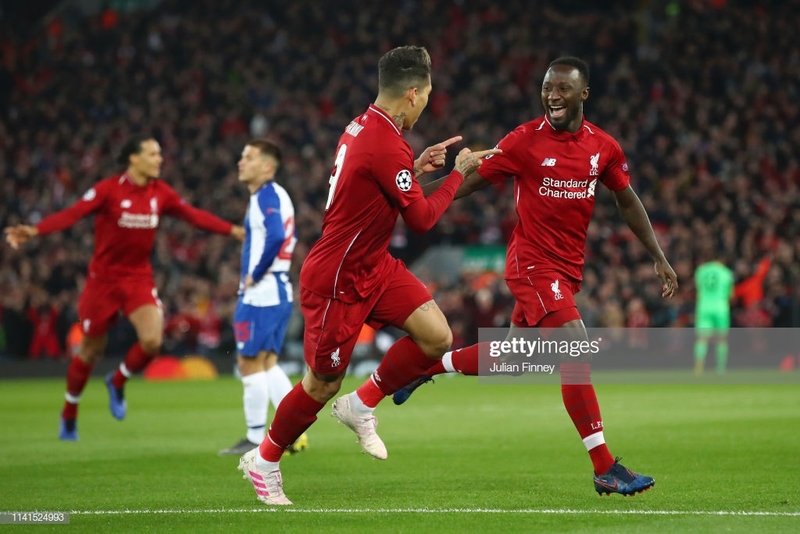 Liverpool recorded a 2-0 win against FC Porto at Anfield to take control of their Champions League fate, with goals from Naby Keita and Roberto Firmino rounding off a professional European performance. It appeared for all the world like Jurgen Klopp's side would run away with the game just as they'd done last year in Portugal when two goals inside twenty six minutes put the home team 2-0 up. Naby Keita would have his second goal in as many games inside just five minutes, continuing where he left off at St Mary's with another bright performance in the centre of the park. The former-Leipzig man has endured a tough start to his Liverpool career, occupying a peripheral role amid the current title challenge despite being tipped to be the lynchpin of the club's successes. However, he now appears to be getting into his rhythm, purring in possession having previously looked devoid of confidence. Benefitting from a fortuitous deflection off Oliver Torres, Keita's effort stemmed the tide after a strong start from Porto threatened to make it a nervy night on Merseyside. Roberto Firmino would double the scoreline before the half-hour mark, tapping home after Trent Alexander-Arnold's pinpoint ball across the six-yard box, but it was Jordan Henderson who once again silenced his critics. The Englishman has suffered the brunt of criticism in recent years, struggling to live up to the all-consuming pressure of being Steven Gerrard's successor, but proved why he remains an integral part of Klopp's side just as he did in Friday's 3-1 win. Seeing the bigger picture, it was Henderson's perfectly weighted pass that unlocked the Porto defence and set Trent in for his eight assist of the campaign. Thriving in a more advanced position, the skipper proved to be the orchestrator on another big night for his side. While Liverpool would fail to add to their tally, the second-half saw a mature and well-managed performance from the hosts. A night of relative comfort, with Porto showing little more than glimpses of threat, this was the latest fixture to tick off the calendar on Klopp's quest for glory. Opting for a midfield three of Fabinho, Henderson and Keita, Klopp's selection paid dividends, with the combination of all three players culminating in a lovely balance. Fabinho provided the steeliness, racing into tackles to stifle Porto going forward while Keita was given the freedom to spread his wings and Henderson tasked with upping the tempo just as he had done at Southampton. Together, they delivered a strong performance in the middle of the park, giving further proof that the club captain might be better suited to a more advanced role as in the 2013/14 season. While Georginio Wijnaldum is likely to return at the weekend, having played an instrumental role this season, it will give Klopp food for thought for the games ahead should he require a change of tact. Having signed in the summer, Keita was supposed to be the conductor to Liverpool's successes, the man to provide the creativity lacking after the departure of Philippe Coutinho with driving runs offering another dimension to the side. However, a sluggish start and unlucky injury resulted in a fall from contention, with the No.8 playing a peripheral role for the majority of the campaign. Yet, as he had on Friday, the 24-year-old showed signs of coming good. In the Bundesliga, Keita was a multi-faceted weapon for RB Leipzig, bombing forward from deep with the nous and confidence to embark on mazy runs before slotting into the net. While there remains room for improvement before he replicates those heights in red, he now seems to be on the path to doing so and could prove to be a useful weapon in the remaining Premier League and Champions League fixtures.